At around 5:15 pm on Saturday, 6th April, 2019, up to an estimated 600 million people, in over 100 countries around the world, will be watching the running of THE most famous National Hunt ( or 'jumps' ) race on earth, The Grand National. Run over a distance of four and a half miles, tackling a total of thirty fences, this surely is the ultimate test of stamina, endurance and jumping ability for a National Hunt horse and jockey. The Grand National has a certain magic about it with millions of people placing bets on their favourite horse or horses. Many of these people would never normally watch, let alone gamble on a horse race at other times of the year but this race captures the imagination as, potentially, any one of the horses in the forty runner field that jumps well and has luck on its side can win the most valuable prize in National Hunt racing. The race itself is run on Aintree's 'National Course' and horses complete two circuits, each of which has sixteen fences. Many of the fences on the 'National Course' are famous for their severity, notably Becher's Brook, The Chair, the Water Jump and the Canal Turn. On the second circuit, after the 30th fence, runners bear right, avoiding The Chair and Water Jump, to head onto the run-in to the finishing post. 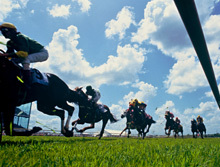 After negotiating "the elbow" the exhausted horses are finally on the home straight and only yards from home but it is on this run-in — the longest in the United Kingdom at 474 yards — where many epic battles have occurred on the way to the finish and one of the most prestigious prizes in horse racing can be won or lost. The Grand National is the centrepiece of three days of the highest quality jump racing at Aintree's Grand National Meeting - one of only four race meetings run at the track during each year. The meet is seen as the finalé to the National Hunt season and follows less than four weeks after The Cheltenham Festival, which gives many of the 'big names' that ran at Cheltenham just enough time for a short rest before preparation starts for another stern test of their ability. A fantastic start to The Grand National Meeting with a celebration of 'all things Liverpool'. Celebrities, musical acts and sporting legends from the city have been part of the off course entertainment in previous years to compliment a seven race card which includes five graded races and The Foxhunter Chase, which is a race for amateur jockeys, run over The Grand National fences. The second day of the meeting is Ladies Day and is all about fashion and glamour. Said to be the top day out in the North West social calendar, Ladies Day has many off course attractions, competitions and giveaways, with fashion as their theme running throughout the day. On course the race card features seven excellent races including the Top Novice's Hurdle and The Topham Chase which gives the professional jockeys their first chance to take on the Grand National fences. The final day of the the Aintree Grand National Meeting and what a way to finish, the parade of past winners, the military band, the off course traditions and excitement, and on course, The Grand National - The World's Greatest Steeplechase. Well over 60,000 people will be at Aintree watching Grand National history in the making, as another top drawer seven race card brings the meeting to a close, including a total of six graded races, this really is National Hunt racing at its best. So this year, why not take a trip to Aintree and discover all that happens at The Grand National for yourself. Take a look around the award winning visitors centre and Aintree's Weighing Room, where you could sit in the chair where the jockeys are weighed. Visit the stables, the winner's enclosure and pay your respects at Red Rum's graveside but more importantly, marvel at the sight of the finest horses and jockeys, competing in The World's Greatest Steeplechase for the right to be crowned the next Grand National Champion.